There are few places in the world that have captured my heart quite like the Maldives. I mean sure, I can’t give a solid answer as to my favourite place in the world on a good day… but this country would have to be up there in the few I can count on one hand! 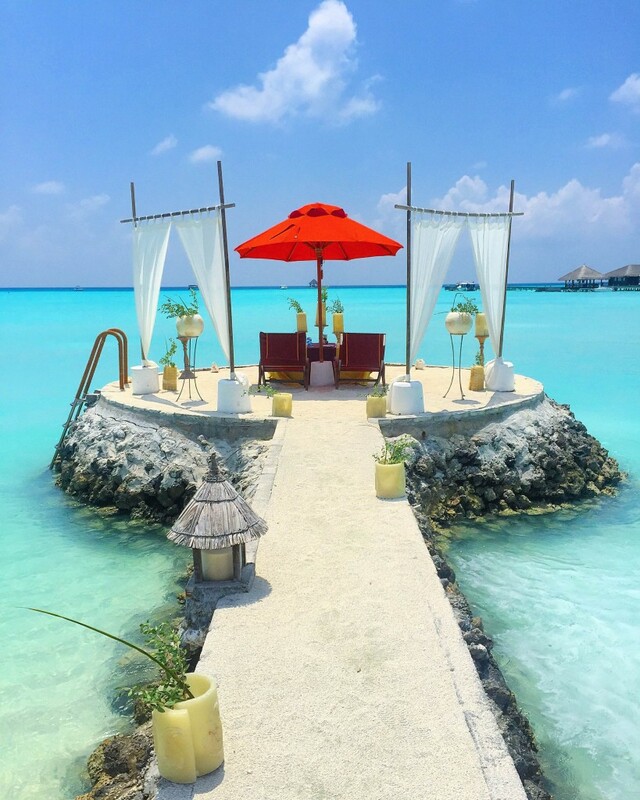 Recently myself and my partner set off on a not-our-honeymoon honeymoon trip to experience the Maldives as it is so well set up for – as a couple. While I’m usually off balancing my jet-setting around the world solo with a week or two at home to see him, I was very excited to bring him along on an adventure and share this special destination with him. So… wondering how to honeymoon in the Maldives? We’ve got you covered! 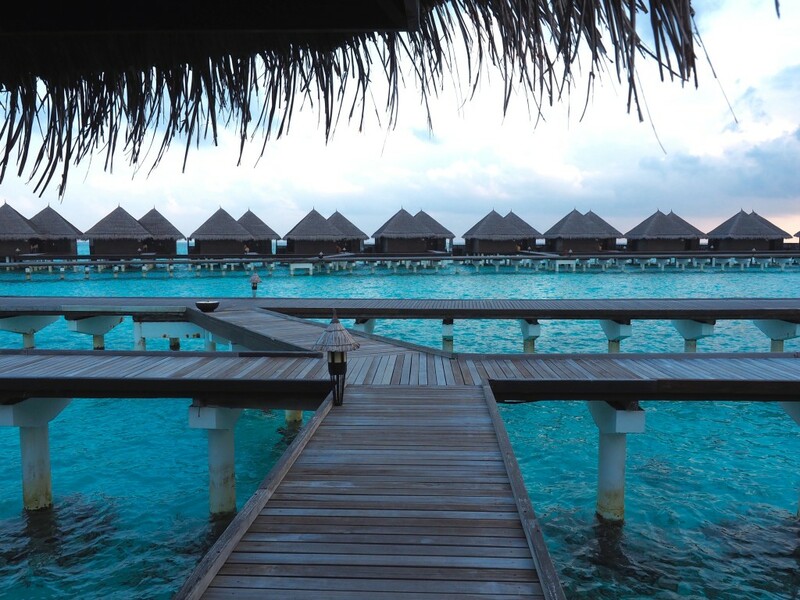 The Maldives are a collection of 1192 islands – each their own unique paradise. Being surrounded by water means you will have plenty of chances to try water activities, such as snorkelling, diving, kayaking, parasailing, stand-up paddle boarding, paddle boating, jet-skiing and so much more! While relaxing is nice for a day or two, after a couple of days to unwind in the Maldives you begin to get your groove again and with so much on offer by way of activities, you’re best to make the most of it! These water bungalows are as quintessential as a stay in the Maldives comes. Imagine waking up each morning with the ocean at your finger tips, ready and waiting for you to take a dip off your private deck and enjoy the marine wildlife on display. These rooms also often come with a private plunge pool which is a pretty good way to catch a sunset in the arms of your significant other! Tip: When booking your hotel room, be sure to specify whether you want a sunrise view room or a sunset view room depending on your preference. Although the best food we ate in the Maldives was at Deep End restaurant, the best dining experience was a private dining beach setup at Taj Exotica. Each resort offers their own spin on the private dining set up – be that on the water, in the sand, or in the privacy of your room – so be sure to see what is on offer and book a private dinner to surprise your loved one. 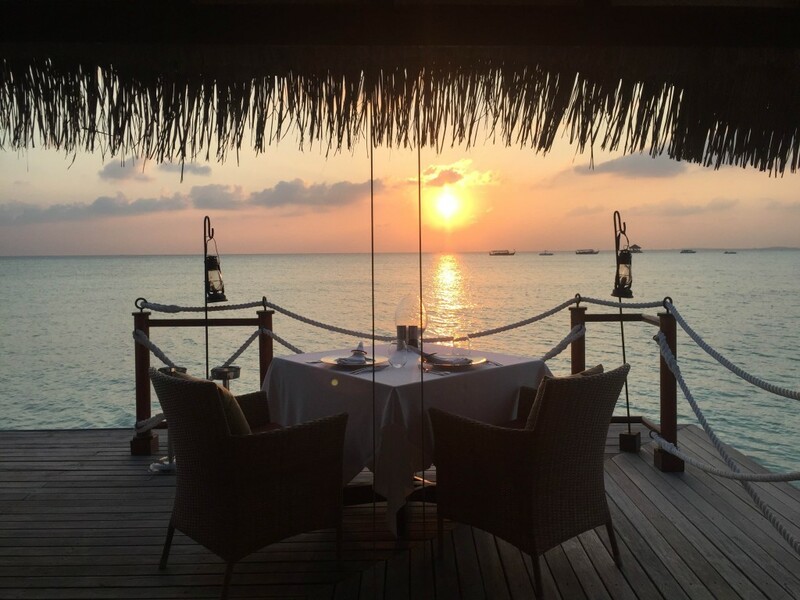 Although the sun sets relatively early in the Maldives (around 18:00-18:30 in March), we made a point of being at our dinner table each evening, ready to watch the sun set. This is by far the most romantic time of the day and a great time to reflect on all the fun you had that day. There’s just something so magical about a sunset that words can’t describe! A sure fire way to enjoying your honeymoon is to make sure you mention it when making the booking, as well as mentioning any other special occasions like anniversaries or birthdays, as the staff will go out of their way to make it a memorable one. 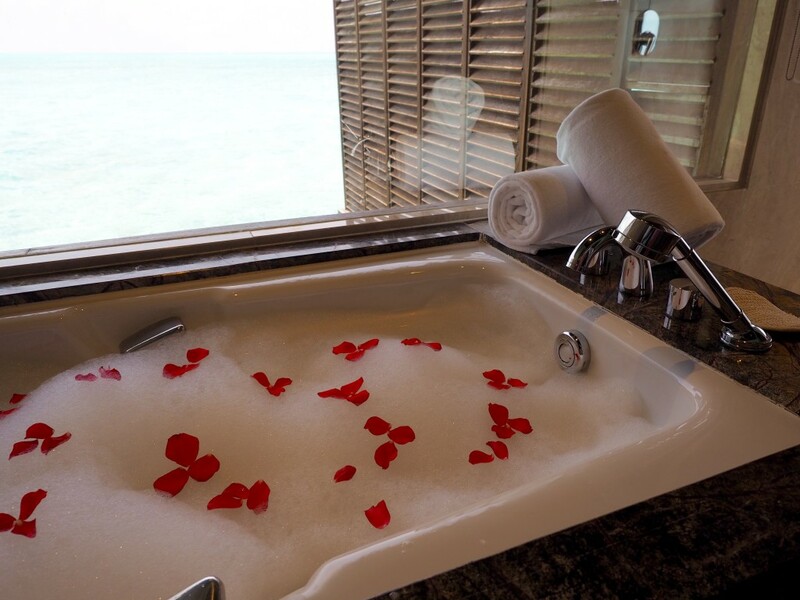 Think rose petal bathtubs, rose petal beds… and chocolates galore! Sunrise and sunset are my favourite time of day – especially when the sun lights up in playful colours. 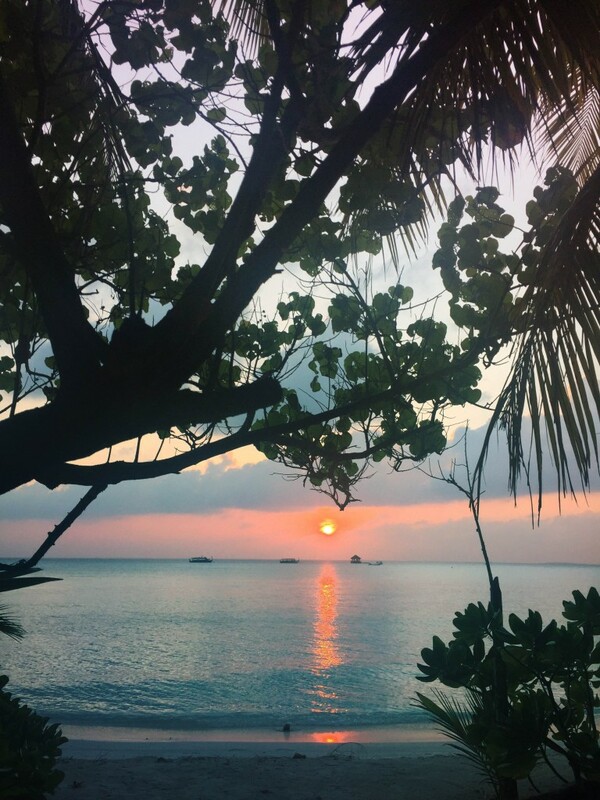 The Maldives offered especially impressive sunsets, with each one outdoing the other as the days rolled in to the next. This was a great time to have a pre-dinner drink and cheers to an amazing holiday together, as well as a chance to reflect on our day. Whatever you do – don’t miss a single sunset together! And I mean ALL of the sunsets! Just incase you didn’t hear me the first time. Enjoy your honeymoon in the Maldives – I have no doubt it will be everything you imagined! I would so LOVE to visit the Maldives. It looks so gorgeous! I have been thinking for a budget honeymoon destination for my Bro and his bride to be. AHHH I loved reading this Brooke!! I have been waiting for you to travel to the Maldives for 2 years now!!! Ha. I lived in the Maldives all last year and am set to move back in 2 months time. You have truly captivated the specialness of the Maldives in this post and in your amazing ‘non-honeymoon-honeymoon’ video as well!! So happy that your gorgeous boy got to experience the magic of the Maldivian islands as well! Your stay looked nothing short of incredible as usual, but am just so happy to see that you loved Maldives just as much as I hoped you would! And agree with your tip – choose a sunrise or sunset bungalow! The sunsets of Maldives are just something else – the colours!! All the best with your Europe adventure! First time in two years I won’t be doing a Euro summer as am planning on staying put in Maldives so will just have to relive my Europe adventure through you!!! Enjoy beautiful and happy travels! Looks beautiful. I must go someday! !